Hey there! We hope that you're having a fantastico summer, wherever you are and whatever you might be doing. We've been busy bees (as always), organising our new ranges for the new season, which has crept up on us! It's mightily difficult to consider the winter months when you're feeling hard done by because the summer's been so useless, but hey ho off to work we go! Our first range for A/W 2011, is one you might recognise as we've brought it back out of the archives. Yep, we're talking about Acrylic Art. A zany, funky collection of laser-cut acrylic necklaces, GUARANTEED to let your neck do the talking! 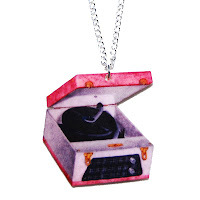 Our faves from the range include the Vintage Record Player Necklace, £12, so unusual, we can't stop looking at it. 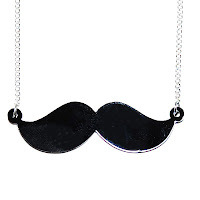 Or the Moustache Necklace, £11, which adds an androgynous (tipped to be a big look for A/W) touch to the most girly of outfits. 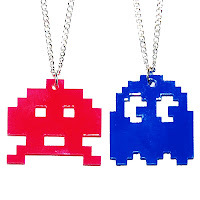 Ultimately though, the absolute master of the collection is this uber-amazing, superbly quirky Retro Game Necklace, £10. It comes in a choice of bright pink Space Invader or blue Pacman Ghost design. *Some* people have been known to purchase both, refusing to choose between them!